This is a "Less Agressive" sticky tag which leaves 'less' residue when removing from products. It also is easier to take off so it might be more susceptable to swapping. All prices already include shipping costs. Normal shipping is UPS Ground. 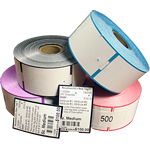 Minimum order is 4,000 tags per order. The price below is for 1 Box of Tags The "Qty" selection below is for 1 box or 4,000 tags. Select the higher quantity level for better discounts. To mix and match these tags with our colored tags, you would need to submit your preferences in the comment section at checkout.